The Cathedral Caves and local area have a rich archeological history. Man has been visiting and living in the caves for at least 5,000 years. Some of the probable indians to visit the cave include Archaic, Cohonino, Pai (Havasupai, Hualapai, Yavapai) and maybe others. Trade and/or Conflict probably occured with other regional groups such as Hohokam, Yuman, Salido, Navaho, and Apache. So we expect to find a wide variety of cultural types as we study the site. Currently NAU PhD candidate Cristin Embree is working on her thesis at the cave. Pictured below are some of the cultural materials we have found in and around the cave. The round stones are manos that were used for grinding seeds. 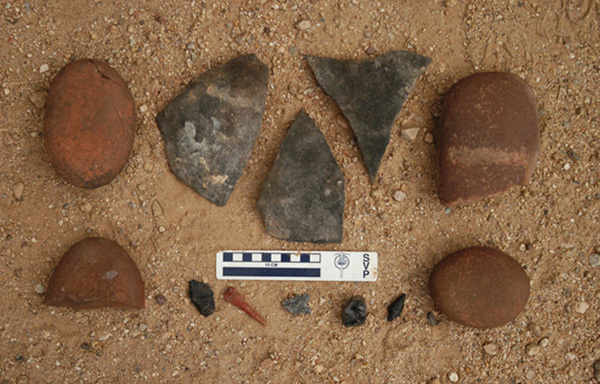 The three large pottery sherds are fragments from a large fired pot. Along the bottom are pictured arrowheads, obsidian debitage, and a drill point. One of the arrowheads we found in the back of the cave had a broken point, and was located near a current Javalina nest. Were the indians of past hunting Javalina in the cave? Through research we hope to answer this and many other questions.